A Midwest native, Jennifer Klepper made stops in Dallas, Charlottesville, and Boston before settling for good in Maryland. While she has an appreciation for the expansive beauty of the plains states, she hopes never to live landlocked again. Jennifer attended Southern Methodist University and the University of Virginia School of Law, her law degree guiding her through the worlds of corporate law, tech startups, and court advocacy for foster children. She is an ardent consumer of podcasts and books that challenge her with compelling and unfamiliar topics. When she’s not writing, she’s crossing things off a never ending to-do list and hoping to catch that next sunset. Jennifer lives near Annapolis with her husband and two kids. 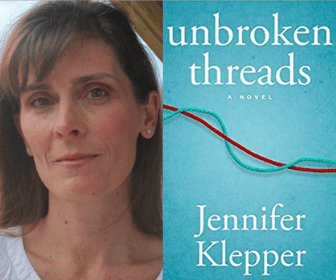 Jennifer’s USA Today bestseller debut novel, Unbroken Threads, is published by Red Adept Publishing. Jennifer is available to meet with book clubs (virtual or in-person) via NovelNetwork. Schedule your visit here!